This paper discusses the need to incorporate equity assessment into the planning and monitoring of sanitation service delivery to South African informal settlements. Equity assessment criteria were drawn from literature and a study of sanitation service delivery to informal settlements in three South African municipalities (Cape Town, Johannesburg and eThekwini) over the period 2012–2015. Three key dimensions of equity – resource allocation, access and stakeholder perceptions – were identified. These had eight associated criteria: (1) funds allocated for basic sanitation, (2) number of staff allocated to informal settlements, (3) disparities in access, (4) proportion of functioning sanitation facilities, (5) menstrual hygiene management (MHM) inclusion, (6) access to information, (7) meets users' notions of dignity, and (8) integration of the perspectives of key stakeholders. 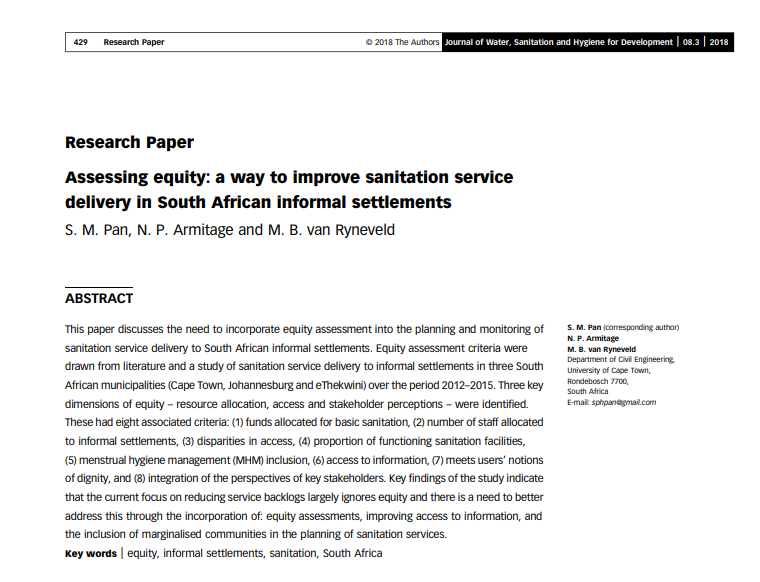 Key findings of the study indicate that the current focus on reducing service backlogs largely ignores equity and there is a need to better address this through the incorporation of: equity assessments, improving access to information, and the inclusion of marginalised communities in the planning of sanitation services.